If attention is the media industry’s currency, Facebook is obsessed with building the world’s largest mint. And if Zuckerberg succeeds, there’s no limit to what the company will be able to buy. In February, I outlined a vision for the future of media where “attention” would be the digital era equivalent of fixed transmission infrastructure (e.g. broadcast spectrum, cable systems and so on). What makes this view discouraging is that most of the incumbent (video) media aren’t prepared for this concept to become a reality. Instead, they remain focused on harvesting every last dollar in the traditional ecosystem – even if it’s at the expense of investing in their digital future. This pattern brought about a common read question: who then is actually doing this well? The resounding answer is Facebook. And it’s critical to note how hard Zuckberberg has worked hard to make this so. While the company dominated the desktop internet experience, it initially struggled to adapt this strength to mobile. 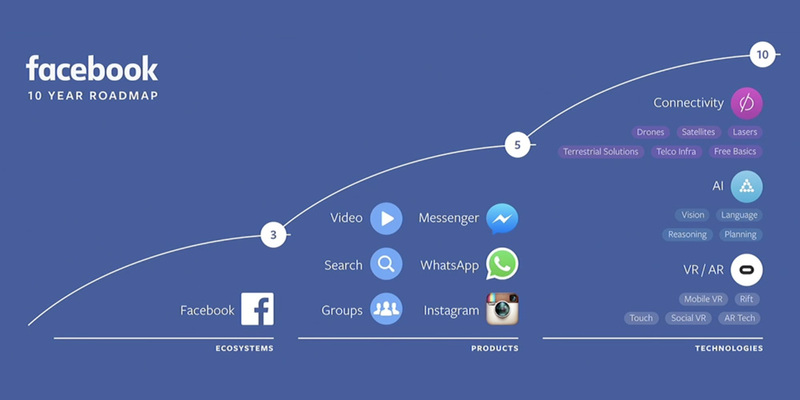 Part of this was timing; by the time Facebook invested in mobile attention infrastructure (e.g. the HTC Status, which came with a dedicated Facebook button, or Facebook Home, which essentially replaced the Android UI), the mobile OS market had been largely secured by Apple and Google. In addition, device-based APIs (e.g. contacts) meant that social networks could be quickly rebuilt for new apps (download any messaging app and you can instantly contact anyone in your addressbook, no need to search and “add” them à la Facebook web). At the same time, Facebook struggled to compete with new social applications. Seven months after Instagram was launched, Facebook announced Facebook Camera, which was shuttered alongside the company’s Snapchat competitor, Poke, two years later. Solving this problem required boldness. And that’s what Zuckberg delivered. Between 2012 and 2015, the company attempted to buy any mobile platform that might supplant it, including the successful acquisitions of Instagram ($1B) and WhatsApp ($20B), and failed ones such as Snapchat (Facebook allegedly made three separate offers over the years). This strategy wasn’t all encompassing. The company didn’t bid on Twitter or LinkedIn, but it’s not clear what these would add that the company doesn’t already have at scale (a messaging and sharing feed, identity management etc.). And when Facebook does struggle or fail (early Facebook Messenger, Poke, Camera), it buys. Furthermore, the company has also launched several independent “constellation” apps, including Paper and Messenger. A feature doesn’t need to be baked into the core experience. It just needs to be used. This thesis (and its criticality) are shown by what we consider to be the “homescreen problem”. There’s a tremendous amount being spent today on driving app installs. And with millions of available apps, driving an install is a significant achievement. But if an app is downloaded to your fourth screen of apps, is it really downloaded? Even if it’s used from time to time, it’s the homescreen apps that establish a “feed” or become a constant (and often reflexive) component of their customer’s lives. That’s why ad spend is so rapidly accruing to Facebook. When you scale up billions of hours of attention, it isn’t that hard to make money. 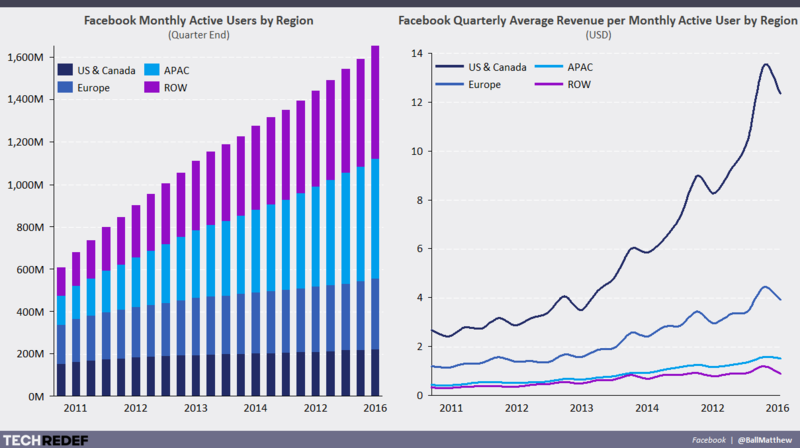 Facebook is also dead set on owning the tech infrastructure of the future: see the company’s investment in Oculus Rift ($2B), Artificial Intelligence, Bots, drone-based internet that will bring access to hundreds of millions around the globe, and more. Many of these gambits are hard to rationalize from a direct business-case perspective (WhatsApp is free and has promised to never run advertisements). In truth, they only make sense in the context of Mark Zuckerberg’s ultimate goal: making sure that Facebook is the Internet. If he’s successful, Facebook will own attention infrastructure, communications infrastructure (WhatsApp, Messenger), your relationships and family/friend-trees (Facebook’s social graph), online identities (Facebook log-in), online experiences (virtual reality) and on and on. Whatever you do and however you experience it, Facebook powers, delivers and manages your online activities. The long-term potential of this vision is most clear when we look at virtual reality. To many, VR is the “uber OS” – the screen to replace all screens. But really, its capabilities are far more significant. If you own the VR layer the way Facebook owns mobile web, you control and administrate everything: identity, connection, payments, data, entertainment, information, interaction. If all existence is in a world you control, you can’t not make money – everything, even physics, are under your control. To put it another way, do you think God would struggle to monetize? This hits at the fundamental difference between tech attention infrastructure and that of media. The former can not only monetize in countless different ways, it can extend into virtually anything else. Especially media. Though each of the major tech giants has advantages here, Facebook’s may be the most intimidating. Their attention infrastructure (and Zuckberg’s attention to it) is about a lot more than just aggregated time. Facebook’s multi-platform, multi-media, multi-app, multiple times a day access to consumers makes Facebook the best distributor of content – any content – on the planet. No one else touches every mass and niche taste at scale, especially with the company’s unmatched frequency and interest-related user data. As a result, the company can functionally guarantee content will hit its target audience, and that’s a highly monetizable (or financeable) capability. In five years, will an exclusive Beyoncé concert be on HBO or Facebook? Could HBO really outbid the company or out monetize? Which distribution platform will better for the artist or the fans? Will there be a difference? For the media business, this means two things. First, technology, platform and audience relationship development will be critical. More broadly, competition for attention infrastructure requires investing in diversified attention footprint. This means pursuing various distribution models – identity feeds, scale feeds, social feed navigation – as well as a constellation of arms-length digital projects (e.g. Turner’s E-League). It’s not enough to have a single front porch, single format or single method of monetization, familiar though that may be.